Use your cell phone on multiple networks. Say goodbye to network restrictions. Lower your monthly cell phone bill. How to unlock my Palm phone with doctorSIM? To unlock your Palm cell phone all you need is your IMEI number and the name of the original carrier. We will scan multiple databases for your unlock code and then send you simple step-by-step instructions on how to complete the process. Is network unlocking a cell phone legal? Unlocking a cell phone from one network for use on multiple networks is totally legal. In fact, unlocking via IMEI is recommended by the phone manufacturers and network carriers themselves as it will neither harm the phone nor void the warranty. How do I unlock my Palm cell phone? First, you need to know the country and original carrier of your Palm. Then, select the appropriate unlocking service and complete the remaining fields including your cell phone's IMEI number. Finally, to submit your request, choose one of the many secure payment methods available to you. My Palm has been reported by the network due to an unpaid bill. Can you remove my Palm from the blacklist? Unfortunately, our unlocking services cannot remove a cell phone from the blacklist. Our unlocking services are exclusively for releasing phones locked to one network for use on any other. You will need to contact your network for assistance. How do I unlock my Palm cell phone from home? To unlock a Palm, insert a SIM card from a different network carrier to the original and type the unlock code. The unlock code will be sent to your e-mail address within a guaranteed time frame allowing you to use your Palm on any compatible GSM network in the world. How often do I need to unlock my Palm? doctorSIM's IMEI-based unlocking services are permanent. That means forever! 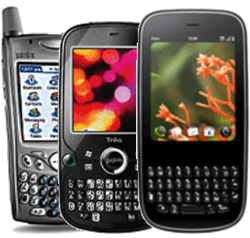 Your Palm cell phone will never re-lock even if you restore it to factory settings or update the software. In the extremely rare case you are asked for the unlock code again, simply retype it. What happens if I type the unlock code incorrectly or it doesn't work? You have an unlimited amount of attempts to unlock your Palm as this particular make doesn't have this restriction. If the unlock code doesn't work for any reason, contact our customer support team immediately for help. Is the price of the unlock code final or are there any hidden costs? We believe in total transparency at doctorSIM and will not charge you additional fees after you've paid for your unlock code. The price indicated once you have selected the country and network carrier is the final price including any current discounts or promotions. Before submitting your request, read the descriptions carefully to make sure you select the correct unlocking service for your Palm. Keep using your Palm device while we unlock it. Use your phone with any carrier. The fastest way to unlock your cell phone. Experts on unlocking phones locked to any network. SSL secure; shop free of concern for your personal information. Simple instructions sent to your e-mail inbox. Special discounts for bulk unlockings.